Since 1972, Roland has worked to create the ultimate piano experience, and our new LX pianos are among the most exciting yet. We wanted to build a luxurious upright piano for the connoisseur, with the rich sound and graceful appearance of an acoustic, along with a multitude of advantages only possible with a digital piano. 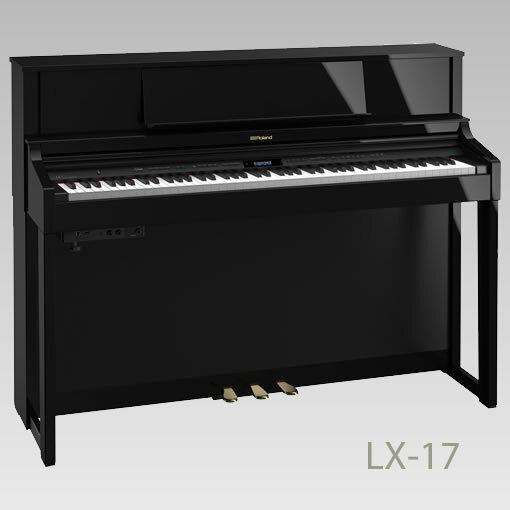 The LX-7 is powered by the latest version of our acclaimed SuperNATURAL Piano Modeling technology, along with a unique keyboard that blends wood and molded materials for great feel and durability. The LX7 houses a three-way, six-speaker system, driven by a powerful four-channel amplifier. Each section fulfils a specific role in delivering superior piano tone, producing an authentic grand piano sound. The powerful cabinet speakers provide the all-enveloping main piano sound, while the top-mounted spatial speakers reproduce the resonance of the piano’s frame. Finally, the nearfield speakers project the sounds most likely to be noticed by the player, including dramatic, dynamic overtones and hammer noises as they hit the piano string. The increased height of the cabinet further enhances the tonality of the sound.